Rain on your wedding day is a sign of good luck – so why not welcome a rainy wedding day with some colorful and chic rain boots? 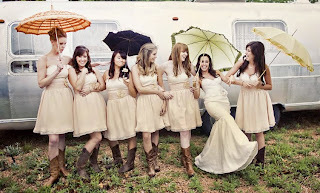 I love how the rain boots brings a humorous touch and a bit of whimsy to the bridal party with the matching hot pink boots! Although rain boots are sometimes thought of as bulky and cumbersome, shockingly these boots with black and white polka dots come off as stylish and classy. They really add a touch of personality and individuality to your wedding photos. This dainty lace pattern rain boot is perfect for a vintage outdoor Fall or Winter wedding. You can even add a splash of color with the posh dots rain boots! Kate Spade’s rain boots have an elegant spin with the ribbon bow on top and a slight heel and pointed toe. What do you do if your wedding happens to turn into a rainy day? Put on some fabulous rain boots (or in this case, cowboy boots) and frolic in the rain!